Here is the updated video for the new Modo Applink. It's definitely one of the better Applinks, now. Thanks again, Robert, for your help on this. 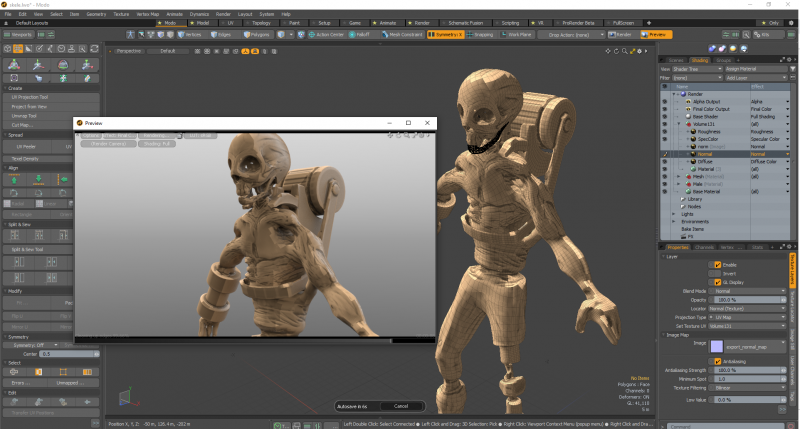 The normals sent over from 3dcoat are off in modo. I've tried messing around with different normal map export options but can't seem to get it right? Thank you for creating a new video about the Modo Applink! Your tutorials are done so thoroughly and illustrative! Thanks for the feedback! I’d like to reproduce the issue you are experiencing to see what could possibly be done to fix it. Btw. I did notice that jagged artifacts in textures render out more explicit in Modo than in 3D-Coat, but these were cases with artifacts caused by painting on (jagged) uv seams. I find that if I invert the green in the normal map, with Modo's render, it works properly, but Vray doesn't work with RT GPU for some reason. I basically; sculpted in 3dcoat - did an autotopo - baked sculpt onto retopo with auto uv. Then used the 'send to modo'. Normals are off, (can see the seams), I tried to invert the green, still weird. Just read that Modo by default interprets normal maps in the OpenGL way instead of the DirectX way and these two interpret the green channel contrary (because the y axis in UV space is inverted). So inverting the green channel in Modo is one option - thanks for the hint! The other option is to invert the green channel when exporting from within 3D-Coat. 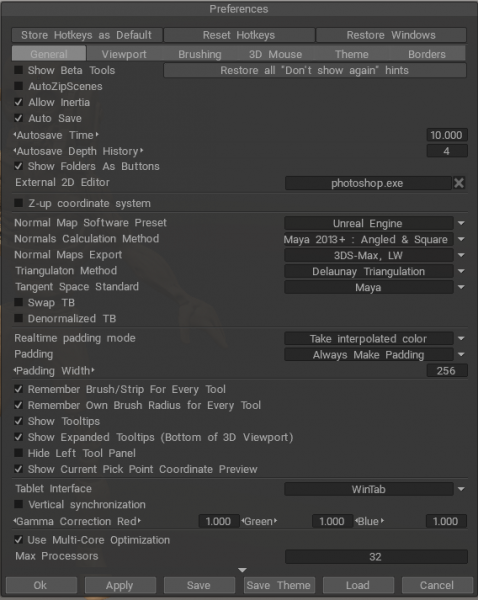 This can be done by setting the "Normal Maps Export" in the Preferences to "Maya, Blender". By the way I have to agree with Gary (https://3dcoat.com/forum/index.php?/topic/20056-why-so-many-normal-map-options/ ) stating that the option to invert the green channel in 3D-Coat might be more accessible with a separate checkbox (or by naming the dropdown options like "OpenGL" and "DirectX") instead of binding the preference to Software names. The software specific stuff should only be saved in within the chosen options of the "Normal Map Sofware Presets". Unchecking "Denormalized TB" seems to create a padding once, which had a positive effect here (though does not completely solve the issue). Also make sure "Create Padding" is checked in the export dialog. I believe the issue is partly caused by the jagged UV map 3D-Coat's auto unwrapper is creating. On your model the critical areas probably are placed on that kind of UV seams, too. Modo seems to be pretty merciless rendering jagged UVs, but I’d be interested to know if this is just a question of correct settings on the mesh or texture maps. Currently I didn’t get better results by manually exporting/importing the normal map. Let me know if there’s anything particular to take into consideration. I do notice though that the critical areas are already visible in 3D-Coat (at least in my test case), but harder to see. So ultimately a nice UV map might solve this, but more tips and hints on a smoother normal map exchange are very welcome! Thanks for the added info. Could you append the Applink Manual by pasting this information into it? Definitely, I'll summarize it for the Manual! Oh, It was actually pretty simple.. The maps from 3dcoat needed to have the colorspace changed + invert green. exporting manually and dragging in gave me a prompt to adjust color correction (which i had forgotten about before). BTW thanks for this great applink! Can't you switch how Modo interprets the green?